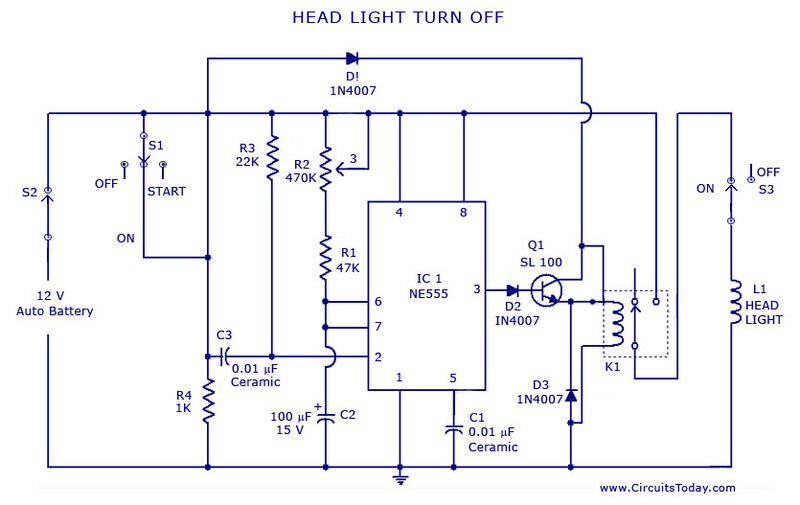 How cool is it to design an Automatic Car Head Lights Turn Off Circuit ? Well, I’ve always fascinated myself playing with car electronics. And today is my day! I’ve come up with a really cool circuit, where you can turn the car headlights “OFF” after a preset time. This cool circuit is designed using the popular NE 555 IC, and a bunch of associated components. You should be a little careful while testing this circuit actually in a car, where if something goes wrong you’re bound to damage car electronics. I advise you play with a used car, that you’ve nothing much to loose even if you blow up things. This circuit when setup in a car automatically turns off the head light after a preset time after the ignition switch is turned off.So you can walk out easily from the dark garage in the light of your car. When the ignition switched on first the voltage from battery is fed to the relay through diode D1.When the ignition switch is turned off it produces a negative going pulse at the pin 2 that triggers the timer. The output of the IC goes high for the time set by R1Â .This makes the transistor Q1 to conduct to energize the relay to drive the headlight.After the set time the light goes off.With the value of components used you can make a setting from 10 S to 60 S.
Fit the potentiometer on somewhere on the dashboard so thatÂ you can easily set the timing. Circuit Diagram & Parts List. Hi what switch is one and 2 because from switch 2 the current is flowing directly to the relay. this means the ignitions switch is bypassed. and switch 3 , what switch is that because surely this circuit should be wired between the headlight switch and the headlight. @ Rinshad – what problem are you facing ? hello. can i ask what kind if switch can be use for S1 and S2? I have been reading out some of your articles and it’s clever stuff. I will surely bookmark your site. hi guys.is there any value for the relay k1..? more details about this circuit and what are the changes do i need to do if the power supply is 24V??? relay can be a 12V, 200 Ohm SPDT relay.